A parallelogram is a quadrilateral (polygon with 4 sides) whose opposite sides are parallel. 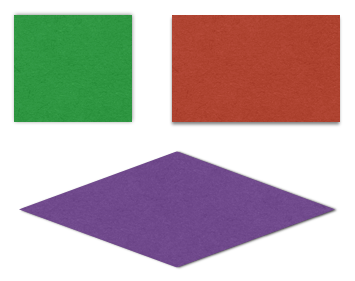 Below are some of the examples of a parallelogram. As you can see, squares and rectangles are parallelograms because their opposite sides are parallel. They are the parallelograms with right angles. The third quadrilateral below is a parallelogram with no right angles. In this post, we are going to discuss how to calculate the area of a parallelogram. Since we have already discussed how to calculate the areas of squares and rectangles, we will focus on areas of non-right angled parallelograms such as the third figure above. Consider parallelogram ABCD in the next figure. Side AD is the base and the blue dashed line the height. Using them, how do we calculate the area of ABCD? Notice that if we drop a line (a height) from C and extend AD to the right (see next figure), then we can form triangle DCF. This triangle has the same size and shape as triangle ABE. This is because of the SAS Congruence — if you want to study further. Now since the triangles have the same size and shape, this means that I can place ABE to exactly cover DCF making it a rectangle as shown below. 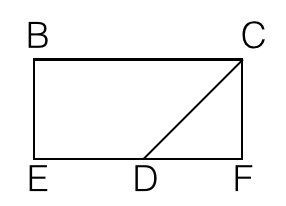 Now, we find the area of rectangle BCFE which is equal to the area of the original parallelogram (can you see why?). We know that the area of a rectangle is the product of its length and width. In the previous figure, the length of the rectangle is BC. But we know that BC is the opposite side of AD in the original figure and opposite sides of a parallelogram are also of the same length, so BC has the same length as the base of the original figure. The width of the rectangle is CF which is equal to the height of the parallelogram. So, the area of a parallelogram is the product of the length (the base of the original figure) and the width (the height of the parallelogram). 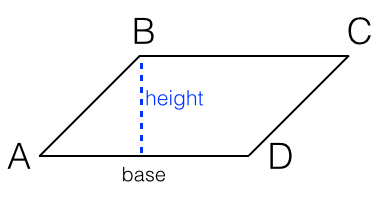 Area = base x height. In the next post, we will have some sample problems regarding area of parallelogram.